IOS App Developer: BIGO TECHNOLOGY PTE. 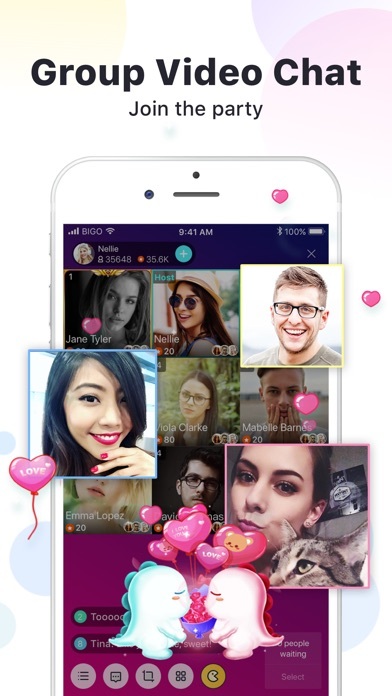 LTD.
BIGO LIVE is a popular live video streaming social network. It allows you to live stream your special moments, live talk with your friends, make video calls and watch hottest videos. Now, BIGO LIVE has reached 200 million users around the world. Don't wait – Join BIGO, broadcast your life, gain many fans, receive gifts and be an idol easily. 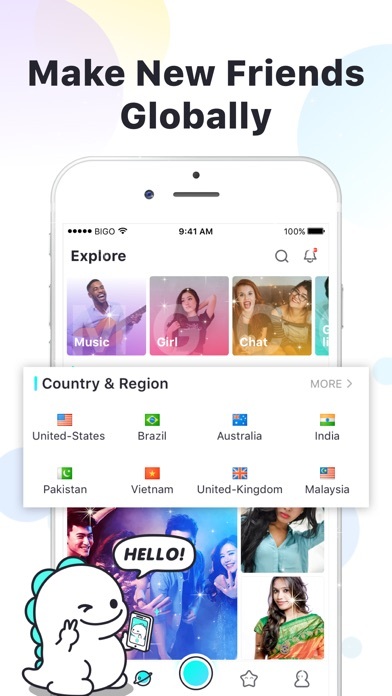 --------Why BIGO LIVE is the best social networking app for you?-------- # Go Live - Singing, dancing, eating, travelling.. Just 1 touch to go live! - Show you talents, get more followers, receive many gifts and be an idol easily. # Watch Live Streams - Whenever you open up BIGO LIVE, there are always people broadcasting. - Millions of talented broadcasters, passionate dancers and singers, big eaters, comedians, etc. present you amazing live streams and live videos. 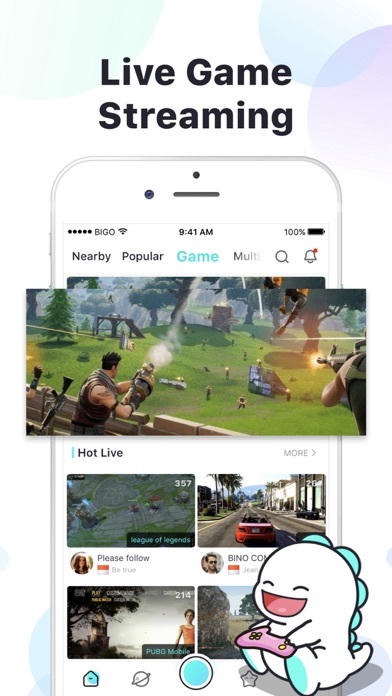 - Watch live streaming of popular games, such as PUBG, LOL, RoV, Fortnite, Dota 2, Hearthstone, Rules of Survival and more. # Live Video Chat & Video Call - Invite friend to start 1:1 online video chat. - Create group video chat or video calls with up to 9 people in Multi-guest Room. - Want to chat with strangers or start a random chat? BIGO can match you with locals or people around the world. 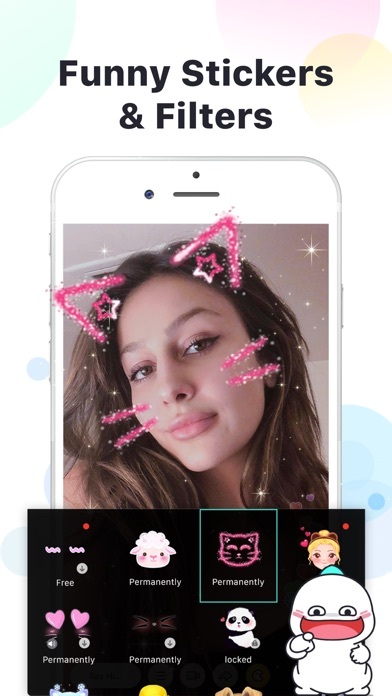 - Use video filters or stickers while video chatting to have fun. Cute kitty face, lovely eyes, crowns, funny rabbit ears, sad tears, etc. are all available. # Voice Chat Room - Live talk with pretty girls or handsome boys from nearby or all over the world. - Live voice chat with voice emoji to have fun. - Here you can sing karaoke together, talk about life and learn foreign languages with your new friends. # LIVE PK (Hilarious!) 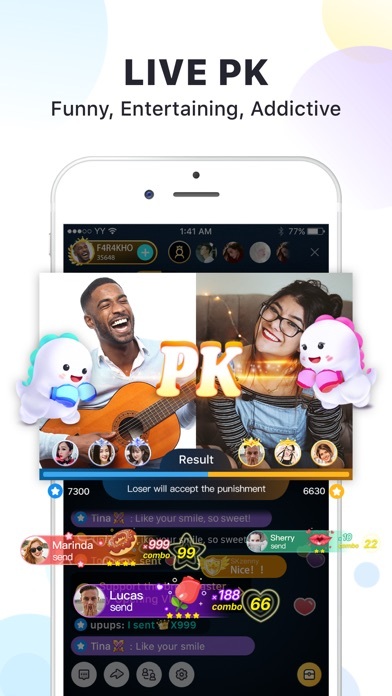 Try PK challenge and have fun with your friends on BIGO LIVE! Broadcasters who get more attraction points will win the PK while losers have to receive punishments. # Vlog (Video Blog) Turn your life and talent into creative vlogs and be a vlog star in BIGO LIVE. LIKE US &STAY CONNECTED Facebook: @bigoliveapp Twitter: @bigoliveapp Instagram: @bigoliveapp YouTube: https://www.youtube.com/bigoliveofficial Your feedback helps us improve BIGO LIVE. If you have any questions, please contact us at feedback@bigo.tv. More IOS Apps by BIGO TECHNOLOGY PTE. LTD.